And with the approach of Memorial Day on Monday, May 25, many people across the nation will do two things. First, they'll spend a portion of the day remembering the soldiers who died heroically while defending America and her great freedoms. And second, most will engage at some point in a patriotic celebration with friends, family and loved ones that is sure to include some good eating, a key part of our American fabric. As a died-in-the-wool fisherman, don't be afraid to try some fish dishes sprinkled in among the traditional steaks, burgers, brats, hot dogs and chicken breasts that will be found on most backyard grills. First introduced to this great sandwich by Orvis endorsed fly guide Rob Woodruff while we were in Vancouver during the beginning stages of a fly fishing trip to British Columbia, this has become one of my favorite ways to enjoy salmon. With that in mind, here is a recipe for how to grill up a salmon burger, thanks to a recipe adapted from OutdoorChannel.com. 2. Make four foil strips that are 5 to 6 inches wide by 10 inches long. Fold each strip to form 5- to 6-inch squares, then fold in edges to seal layers. Coat one side of each foil square with vegetable oil. Divide salmon mixture into four equal portions, place a portion on the oiled side of each foil square and then shape each into an evenly thick four-inch-wide round. If making burger patties ahead of time, lay patties (on foil) in a single layer on a plate, cover airtight and chill up to one day before grilling. 3. Place salmon patties on foil on a barbecue grill over a solid bed of medium coals or medium heat on a gas grill (you'll know the temperature is right when can hold your hand at grill level only four to five seconds); cover the barbecue grill and open up the vents. 4. Cook salmon burger patties until they are firm when pressed and a pale pink in the center (cut to test), a process that usually takes about 10 minutes. 5. When salmon burger patties are almost done, place on toasted hamburger buns and garnish as desired. While most people are going to be grilling chunks of American beef this holiday weekend - think T-Bones, Rib-Eye's and New York Strips - there are few choices that are better tasting than grilling up an Ahi tuna steak. The first key to grilling a good Ahi tuna steak is to have the grill - gas grills are fine, charcoal or wood fire grills are even better - preheated with the grate good and hot (again, you'll know the fire is ready when you can hold your hand at grill level for only four to five seconds). With the above in mind, a good rule of thumb to achieve the right cooking temperature is to let the grill get hot for 10 minutes or so before putting the tuna on. Next, baste the tuna with the olive oil, then rub it on both sides with your preferred dry fish rub. All that's left to do now is to grill it. If you prefer your tuna seared, use a spatula and grill for one minute and a half per side. If you prefer your tuna grilled a bit longer, a good rule of thumb is between three and four minutes per side if you like it more on the rare side. If a medium or medium well finish is preferred, go a bit longer between four and five minutes per side. Once you get the tuna off the grill, serve it promptly and sprinkle some lemon juice on the tuna steaks as guests prepare to dig in. A staple along the Texas and Louisiana Gulf Coasts where redfish are the predominant inshore species, this is a simple recipe that doesn't take long to prepare. Borrowing from the Camo Gourmet recipe on OutdoorChannel.com, start by melting two sticks of unsalted butter in a skillet and setting it to the side. The instructions for this recipe begin with heating a heavy iron skillet over high heat on an outdoor grill for several minutes, literally until the skillet is smoking hot. Next, combine the seasoning mix ingredients together. Then dip each fillet in melted butter, coating each side liberally. Follow that up by generously sprinkling on the seasoning mix, evenly coating each side of the fillet. Follow that up by placing the fillets in the red-hot skillet, pouring a teaspoon of butter on the top of each piece of fish. A key here is not to crowd the fillets, allowing ample room to be able to turn the fish with a spatula, allowing the sides to char. When each side is charred black, about two minutes per side according to the Camo Gourmet recipe, remove and serve to your guests promptly. Living near Lake Texoma, an 89,000-acre lake an hour north of Dallas that is filled to the brim with striped bass, this is a popular regional recipe that I first heard of years ago, a dish that is reminiscent of the taste of boiled shrimp. Without having to make a run to the Texas Gulf Coast, that is. First, start by cutting the striped bass fillets up into medium bite-sized cubes. Next, bring a couple of quarts of water to a full boil along with a spice packet from Old Bay Crab Boil Mix. If desired, add onion slices and/or other desired spices to the water. Then bring the water to a full, roiling boil for a good 15 to 20 minutes before turning off the heat. When the water has stopped boiling, drop in the striped bass cubes into the hot water (not boiling water) and stir them around until they begin to turn white and flake apart. At that point, remove the cubes, drain them well and chill for up to an hour in the refrigerator, allowing the cubes to get good and cold. When thoroughly chilled, serve them with cocktail sauce as an appetizer. To this day, I can see in my mind's eye the scene as my granny went to work on a mess of bluegills that my dad, my grandfather and yours truly had caught on a summer afternoon at Herb Parsons Lake in western Tennessee. The preparation was simple enough but the results were out of this world, enough to ensure that I was an angler from then on. Start by heating the oil in a frying pan, again, shooting for a frying depth of one inch. Next, mix the yellow cornmeal and seasoned flour together in a mixing bowl. Rinse the fish and then pat reasonably dry with paper towels. Follow that up by dredging the fish through the mixture once, then dredging the fish through the egg-wash, and then finally dredging the fish through the cornmeal and flour once again. Finally, fry each bluegill for three to six minutes, the length of frying time determined by the size of the panfish that you are cooking. Remove when done, drain on paper towels and serve hot with fresh tartar sauce. If you're going to fry up a mess of bluegills for the Memorial Day holiday, then you better have some French fries and hush puppies to go along with that delectable meal. Staying with the L.L. Bean Game & Fish Cookbook mentioned above (perhaps the best all-around game and fish cookbook ever printed; if you don't have one, go to Amazon and get one), here's their recipe for hush puppies. Mix all of the dry ingredients together in a mixing bowl first. Next, stir in the onions, the buttermilk and last of all, the egg. Next, heat your lard or frying oil in a skillet or deep fryer until a small pinch of batter dropped in sizzles up and turns brown. Finally, drop in the batter by the spoonful into the skillet or fryer, frying up to a nice brown texture or until the hush puppy actually floats. 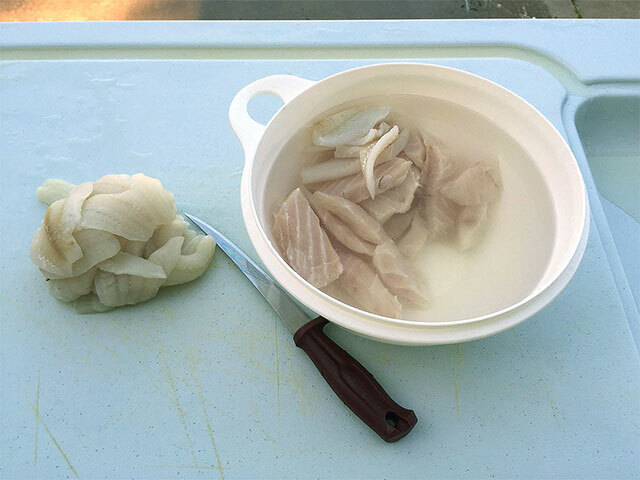 Drain on paper towels and serve with French fries and fried bluegills.While not an exhaustive list of potential Memorial Day fish recipes, the above is a good start to ensure that your love of fishing goes hand in hand with the start to the summer holiday season. Giving an angler even more reason to grab their rod-and-reels, tackle boxes and a Yeti cooler this weekend. To go out, wet a line and collect the main ingredients to some of the best eating that the outdoors world can offer up.